Airport consultant Matthew O’Brien of McFarland Johnson (left) made the main presentation at public hearing. 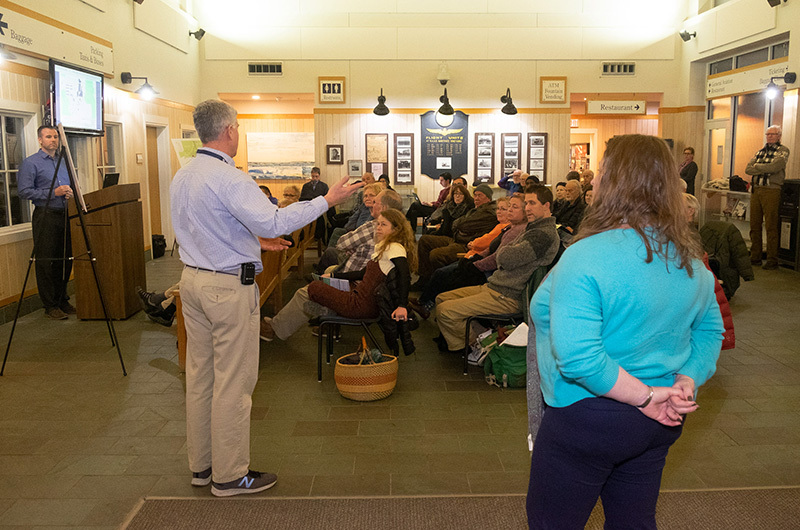 An early-stage plan to significantly expand the terminal and parking facilities at the Martha’s Vineyard Airport saw backlash from Island residents at a public hearing Thursday evening. Among other things, the hearing saw detailed questions about both the need for and environmental impacts of more than doubling the size of the airport terminal and adding another 550 parking spaces. “New, bigger, better isn’t always better,” Chilmark resident Paul Iantosca told airport leaders and state environmental officials. The hearing, rescheduled from mid-January, is one of the first steps in a lengthy environmental approval process for nine projects outlined in an Environmental Notification Form (ENF) filed by the airport with the office of the Massachusetts Environmental Policy Act (MEPA) last month. The projects include renovating runways, expanding the terminal by adding more than 10,000 square feet, adding a right turn lane exiting the airport road and building new hangars for corporate aircraft. In August airport managers began the process of applying for a $39.7 million federal grant to pay for the projects. No funding has been approved yet. About 40 people attended the hearing held Thursday in the main airport terminal. At the outset, airport commission chairman Robert Rosenbaum said all the proposed projects are included in the airport’s 2016 master plan and would still need to clear a number of regulatory hurdles before they could begin. “The master plan is required to be very detailed. This does not mean that every project will be done,” he said. In a presentation and overview, airport engineering consultant Matthew O’Brien of McFarland Johnson said the expansion is needed to ease summer traffic congestion and cramped waiting conditions for travelers. “The terminal has a lot of deficiencies,” he said, pointing to a photo of the outdoor TSA screening area used in the summer months. He also said due to the time required for environmental reviews, permitting and engineering, construction on the projects likely wouldn’t begin for five to 10 years. The only current project is the repaving of the main runway, now under way and due to be completed in May, Mr. O’Brien said. There were questions and concerns from residents. West Tisbury resident Geraldine Brooks questioned why airport leaders would expand the terminal to accommodate a boom in air travel to the Vineyard that occupies only a short time in the summer. “We’re a small rural community and we’re talking about a problem that lasts two months a year?” she said. “We’re going to maintain ourselves as the small-world Vineyard airport,” replied assistant airport director Geoffrey Freeman. “Just by expanding the operation to help the flow of traffic . . . it’s to make sure we can operate,” he added. “This proposal isn’t to build a facility to bring more people in, it’s to make the facility work right now,” said airport director Ann Richart. Ms. Richart, who has been on the job since 2016, recently announced that she will leave in May at the end of her three-year contract. Mr. Freeman said during peak season from May through Columbus Day, airport facilities are strained by the passenger load from commercial flights. He said more terminal space will help during times of peak demand when 100-passenger planes land and take off on tight timetables. “It’s like expanding your kitchen. You really don’t need that nice big island in your kitchen but you throw it in there because it flows better,” the assistant director said. He also acknowledged that air traffic has gone down from past decades, but said the increasing use of larger aircraft is a factor. Dan Doyle, a traffic planner for the Martha’s Vineyard Commission, asked if the airport had traffic data showing why 549 more parking spaces are needed. 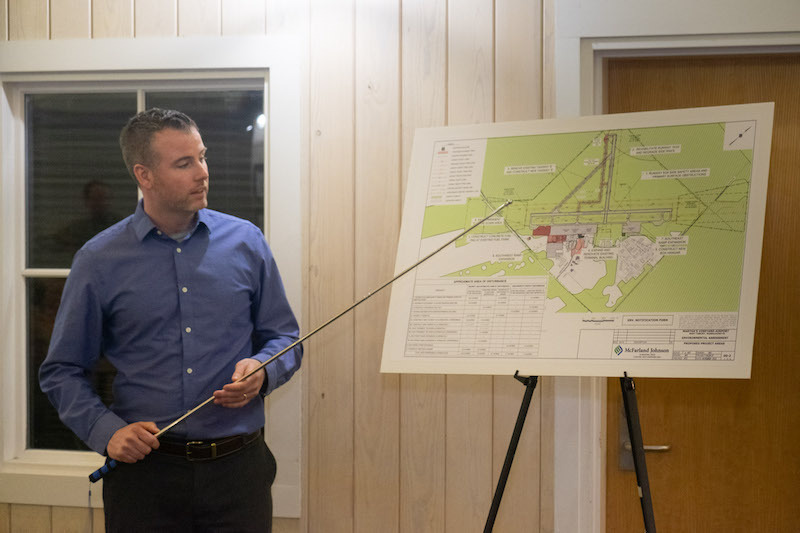 Prudy Burt, a West Tisbury resident and member of the town conservation commission, noted the discrepancy between the master plan, which recommends that the existing 369-space parking lot is adequate to handle future demand, and the current plan. Island conservation leaders raised concerns about environmental impacts from paving over more state forestlands which support habitats for native and rare flora and fauna and help protect Island’s sole source aquifer. The projects require MEPA approval because they would exceed certain environmental thresholds, including the alteration of 118 acres of land, 20 acres of which are rare species habitat. Felix Neck Wildlife Sanctuary executive director Suzan Bellincampi asked for details about what endangered birds could be affected. “There are so many rare species at the start of this study,” replied Jed Merrow, an environmental consultant with McFarland. He named the whippoorwill and northern harrier as two examples. “We will be looking into the specific impacts on these rare species and how to prevent habitat destruction,” he said. Vineyard Conservation Society board member Marc Rosenbaum asked about potential impacts on human health from water or air pollution. “Generally speaking, any impacts to the environment . . those are being looked at in this case,” said MEPA analyst Alex Strysky, who is overseeing the airport’s filing. Mr. Strysky said information and comments are due by Feb. 12 and can be sent to alexander.strysky@mass.gov. He said MEPA plans to issue a certificate by Feb. 22 determining whether the project has complied with agency requirements and outlining a scope of analysis for a draft environmental impact report. Ms. Richart emphasized that plans are still in a preliminary stage. Hey Doug- I agree we need to look at this from a business perspective....we need people to be able to get hear and leave with ease. Most of my customer base have planes and need easy access. You do realize the airport has been here since well before WW2 and you chose to live near it. I don’t get how this complaint makes any sense. The article also stated the numbers of planes coming and going has dropped since the mid1980’s. What’s disappointing, after reading this article is the lack of justification (foundation) for these projects. If infact air traffic is down, in both flights and passengers, why is any of this needed. Until this is established it’s impossible for the public to judge if any proposal makes sense. I think many people worry the goal might be to build a monument to our own stupidity. The current terminal is very nice, people understand the island is crowded during the season. Again, what’s the basic justification. So the airport is paving over rare habitat for parking and private jets even though there is less air traffic, not to mention the existing water issues...seems completely unnecessary, wasteful and blind to the needs of the community. Please, just leave the Island alone it's so nice to see as little change as possible. Preserve not distroy. The airport needs a place to sit with real bathrooms after you pass through security. Sitting outside in August with a Porta Potty isn't right. I know some will say...it's only for a short time. Of course, they'll also complain when they sit for 15 minutes at the Triangle. Hangars will bring in extra revenue. What's wrong with them? The more people that come by plane the fewer cars on the roads and the less of a mess the ferry and the associated traffic around there will be. Might also be nice if we could get one airline other than Cape Air to fly out all year round. Many visitors that fly in do rent cars so not sure your assumption of fly ins cause less traffic.is correct . While more competition for Cape Air to Boston is a good idea it's still a very seasonal market.. but agree the fare is outrageous My JB MVY/JFK ticket is a fraction of that full fare.. I don't mind the tent waiting/staging area.. but I'm a seasonal flyer..
" The more people that come by plane the fewer cars on the roads" HUH? Passengers in corporate jets do not take the VNA buses. They are picked up by black SUV limos that have arrived by ferry, and will be parked in the additional "temporary" parking near the corporate jet hangars. This temp. parking is for them. THINK!! This is not just about expanding to accommodate increased summer traffic. This is about allowing more airlines to come to the Vineyard and increase air traffic over your heads.The airport makes more money by more air traffic. Once this is allowed there will be no turning back. The FAA doesnot care if there are environmental problems and you can never win by suing them to change a course once set. I still miss the old terminal... especially when it rained. Old and funky personality is so much better that over-designed Island boring. Think of this like the overcrowding at your house on all the holidays . People tripping over kids in and waiting to use the bathroom. Wouldn't it be nice to upsize for that and have the FAA pay for most of it? Or maybe you the one that got to the bathroom first and everyone can just wait till Your done! Give me a break this is down road planning for an as of yet unfunded project . Think of the future needs of this entire Island first before you worry about who may be coming to dinner. Hear the voice of the PEOPLE that love this sweet island they know a thing or two!!!! Don't destroy this sweet place! Great example of a vastly overscale, unnecessary set of projects that is only under consideration because Federal grant money is available for it. This whole exercise would last 30 seconds if island town governments had to pay for it. Remember when the new terminal was built and was going to take care of needs for many decades? So now there is less traffic but the big new terminal (which is totally deserted nine months of the year) is not enough? It necessary to double the terminal area because of the crowding yet the problem is caused by the airlines scheduling the large planes to arrive and depart in a short window. The airport can manage the loads on the facility by imposing fees or creating a slot lottery for the airlines to ensure that there are no periods when two or three of the large jets are arriving or departing at the same time. Finally, does it really make sense to encourage more people to use private jets? Talk about carbon footprint, that's a size 16 boot for two people and a little white fluffy dog to use a Gulfstream to fly here from Teterboro. and do we care about inconveniencing ANYONE who is only at MV 2 wks out of the year??? I'm not a fan of expansion ...my trips to the airport to drop off family/pick them up ....or when Ferry reservations were there....never an issue with parking. Tents can be slammed up and porte-potties ....one can choose to install those with sinks/lights.....upgrade the simple things. The biggest problem that they refer to is the bottleneck back up when 3 100 passenger commercial flights all arrive and then depart 15 minutes apart , 3 times a day . That is 300 people that need to be picked up , dropped off and processed thru the TSA. This is our only problem that they are proposing to solve by spending $30 M. If they demanded that these 3 flight spread out their arrival and departure times, the problem would be remedied. They told us , upon questioning, that they had NO say when planes wanted to arrive or depart. Time to refuse them and inform them of our needs. I realize there are problems with TSA space that need to be solved. But it seems to me that the main problems are related to terminal congestion during the summer caused by the airlines all wanting to schedule their arrivals and departures at the same time. That seems really stupid. If their causing the problem, let them get together and figure it out, rather than putting the burden on the Vineyard to build a bigger terminal. Doesn't seem like rocket science. Take the ferry! What’s the rush? Then you can go pick blueberries in your bare feet where they wanna put an airstrip.